The 3-Day Comprehensive Respiratory Review is approved for 22.66 CE credits. To provide each participant with a comprehensive review of Basic and Advanced Respiratory Care along with a step-by-step method of preparation for successful completion of both the Therapist Multiple Choice and Clinical Simulation examinations. The seminar provides each participant a thorough review of the exam content and the opportunity to practice multiple choice questions and branching-logic, interactive simulations. The program provides insights into exam structure, content and techniques for successful completion of each exam. At the review, each participant will receive everything necessary to prepare for successful completion of the examinations. Always up-to-date for the current exam content. Complete review outlines which follow the lectures. Pre-Test to determine your starting level of comprehension. Appendices include Pathology, Pharmacology, Lab Values, and Formulas. Clinical Simulation Book with 9 Instructional Simulations. Scoring and Step-by-Step Analysis of each problem. Disease List & Pathology Overview. Glossary of Diagnostic Terms & Procedures, Normal Values, Ventilator Guidelines, and Test-Taking Skills. Two full-length 160-question Online TMC Practice Exams: Ensure you understand the examination content and that your test-taking skills are sharp. Full-length 22-problem Online Simulation Exam: Test your analysis and decision-making skills. 3 tokens for additional online practice. Choose the practice you want from our extensive bank of Online Clinical Simulations or run TMC Question Modules with detailed audio explanations. Click Here to learn more about our Online Exam Practice. Hundreds of practitioners who are unable to attend the seminar use the guaranteed HomeStudy Program to pass their exams. 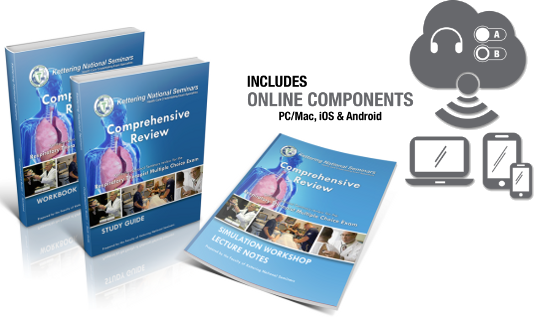 The Respiratory Therapist Multiple Choice and Clinical Simulation HomeStudy programs replace the seminar by providing you with all the material you will need to pass the examinations. You'll receive the same study materials we use at our seminar, plus you'll get online access to all of our audio lectures which professionally guide you through the materials in a step-by-step process. It's like holding your own seminar at home. You'll also have access to our online Clinical Simulation materials comprised of 6 audio lectures and 5 teaching simulations with audio explanations. In addition, we'll also give you online access to 30 practice clinical simulations to sharpen your critical-thinking and test-taking skills as well as 2 full-length online TMC practice exams with 160 questions each. This HomeStudy course is approved for CE credit. Go to our Continuing Education page to find out more. Additional tutor support is available to all seminar participants and HomeStudy users as they prepare for the exam. Each participant will be able to schedule appointments to talk to a tutor and get answers to any questions they have about the materials. If, after using this HomeStudy Program, you are unsuccessful in passing the NBRC examination, you will be refunded all monies, less 30% for processing, registration, and handling. This Guarantee is good for one full year following date of purchase and applies to individuals only. The complete package must be returned together with the original or notarized copy of your examination scores, before a refund can be issued. Requests for refunds must be received within 7 days following a failed exam.